Booking Holdings - known as Priceline Group until 2018 - is one of what are now just two leading companies in online travel services, slightly smaller than arch-rival Expedia by total bookings, but significantly more profitable. Like its rival it has expanded through a series of acquisitions, snapping up a succession of former competitors. Its portfolio now houses long-established US service Priceline, fast-expanding and more internationally focused Booking.com - now its single biggest business by far - and price comparison aggregator Kayak.com. Other units include Asia Pacific operator Agoda, the global RentalCars.com service and restaurant reservation site OpenTable. Each of those companies operates more or less independently of one another. In 2017, the group agreed to acquire European metasearch service Momondo for $550m as well as UK-based airfare reseller Cheapflights. In 2018 it agreed a strategic alliance with Chinese ride-hailing service Didi Chuxing to co-promote each other services. Total revenues for 2017 were $12.7bn on gross bookings of $81.2bn. Net profit was $2.4bn. The group generates almost 90% of its revenues from the international market, significantly more than Expedia, and it wields a mammoth advertising budget. Spend in 2017 totalled $4.5bn, the bulk of which was spent on search advertising. That puts the company among the top ten global advertisers. However brand advertising has also risen (to $392m in 2017) and the nature of those ads has evolved from the joky gags that once distinguished Booking.com's and Kayak's commercials to more thoughtful travelogues. Group CEO Darren Huston resigned in 2016 following an affair with a fellow employee. His predecessor Jeffery Boyd was reappointed on an interim basis until Glenn Fogel was appointed in early 2017. Priceline was one of the pioneers in online travel, originally launched in 1997 with the irrestistible offer "Name your own price" for your holiday. Subscribers may access account assignments and contact information. The searchable account assignments database is available to full subscribers to Adbrands.net premium services. Click here to access Adbrands account assignments (subscribers only); or see here for information on how to subscribe. Account assignments & selected contact information. Adbrands Social Media 6th Mar 2019: "Live Curious". Here's the first big European campaign for Booking.com since Adam&Eve DDB took over the regional account. It's notable how the travel aggregator's marketing has become steadily less quirky and humour-led since it became the dominant player in the region. It really is about the joy of travel now, and A&E have been able to source some pleasantly offbeat local curiosities to highlight. Adbrands Weekly Update 4th Oct 2018: Ads of the Week "European Culture / Sally's Hole". Best-known in the Asia Pacific region, Agoda is one of several travel search engines under the umbrella of Booking Holdings, a sister to Booking.com, Kayak.com, Priceline and others. (You probably didn't realise it, but virtually every major travel search engine is a subsidiary of just two companies: Booking Holdings and Expedia. It's not as competitive a market as you might have thought). Anyway, here are two spots from a brilliantly funny new global campaign for Agoda from Australian creative shop BMF. We love the combination of witty visual simplicity and slightly cheeky content. It certainly beats the Trivago girl! Adbrands Weekly Update 5th May 2016: Darren Huston, CEO of online travel provider Priceline Group, resigned after admitting an extra-marital affair with a member of staff, against the company's code of conduct. His predecessor Jeffery Boyd, now chairman, was reappointed as CEO on an interim basis. Though best-known for US site Priceline, the group's biggest business is international service Booking.com. Adbrands Weekly Update 9th Jul 2015: Ads of the Week: "Wing It". Wieden & Kennedy Amsterdam's ads for travel engine Booking.com continue to mature and evolve. That childish booking/f***ing double entendre has been dropped (almost) completely in favour of fast cuts, attractive visuals and a real sense of the excitement of travelling without much of a plan. Nice one. Let's book a holiday. Adbrands Weekly Update 17th Feb 2015: Ads of the Week: "Booking Hero". 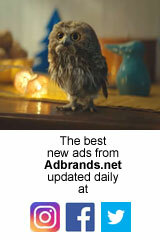 A very nice new campaign from Wieden & Kennedy Amsterdam for Booking.com. Less zany humour than previous spots, less of that cheeky wordplay where "booking" was made to sound like f..., and a more practical approach. We've enjoyed the previous spots very much, but this is a little more grown-up and - for the first time - made us think about actually using the site next time we travel.